Actually it's not so recent now - this post has taken a long time to write, partly because some of the ideas have taken a long time to emerge, partly because I'm not a fast writer, and partly because I've been busy with other things. I must learn to be less of a perfectionist and more timely. I've recently been having some discussions on Twitter with some maths teachers (I love it when teachers engage with each other and with non-teachers - fantastic) about some of the definitions used in their work and in their classes. I was pretty outspoken about some of the things they said (although I tried to be respectful and constructive). I've had to apologise. Unreservedly. I was guided by my intuition as a Ph.D. in Pure Maths, and by my 30 or so years of study, research, and subsequent work as an industrial mathematician. My training is in Pure Maths, my research was in Pure Maths, and then computing, and my work in industry has ranged widely over many disciplines. I believe I have a fair feel for what's going to be useful or fruitful, and I used that as the starting point for my replies. Let me say at this point that teachers have an impossibly difficult task. They need to keep discipline, engage the uninterested and disinterested, encourage those who feel they will never understand, stretch those who find the current work easy, and prepare their students for exams that do not, in truth, test the skills and abilities that are of the most value. Let me talk about definitions. Clear, precise, unambiguous and useful definitions are hard to come by in the real world. Every time someone comes up with a definition for something, someone will find a counter-example, or something that you feel ought to be covered or included, but isn't. Sometimes even finding a definition at all can be hard. What's the difference between a jar and a bottle? What's the difference between a leaflet, pamphlet and booklet? These distinctions can be hard to pin down. But in maths we have the luxury of creating definitions that we want, and then chasing down the consequences. If the definition doesn't produce what we want, we can change it. But many of the definitions we use have gone through the fire of "usefulness." These are definitions that someone created, they and others adapted, modified, changed, warped, or otherwise "fixed" until they were at their height of value. It's important to remember that they are in some sense still arbitrary, but when they have been used for decades, or centuries, and people still use them, you have to feel that they are, in some sense, "right." And so it is with simple things like "even" and "odd." These definitions have emerged over time and have been kept because they correspond to useful ideas. The definition that mathematicians use is that a number is "even" if it is twice some whole number. and 1 is a whole number. and 4 is a whole number. and -3 is a whole number. No, there is no whole number which when doubled gives 7. This last one is interesting - we have to show that there is never a number which when doubled gives 7. Can you show that? What basic knowledge are you using? What "facts" are you using? What are you assuming to be true, and how do you know? So now we ask - "Is zero even?" Well, zero is twice something else - it's twice 0. But is 0 a whole number? And if you say "Yes," why do you say that? Well, we like the idea that whenever we add two whole numbers, the result is a whole number. We like the idea that whenever we subtract two whole numbers, the result is always a whole number. We can choose (if we like) to say that zero is not in fact a whole number, but then we have to include all sorts of exceptions. unless they are equal in size and sign. unless they are equal in size and opposite in sign. See how awkward that is? Of course, sometimes it turns out to be even more awkward to make "the other choice" (whatever that may be) but in the case of "numberhood" is certainly makes things easier to allow zero into the club and call it a whole number. So if zero is a number, and a whole number at that, then it must (by our definition) be an even number. After all, it is twice a whole number, and that's our definition. Now, some people find this unsettling because they've never really thought of zero as even or odd. Some people's intuition says that zero isn't even. And that's fair enough, but it makes life more difficult in the long run. It turns out to be much easier to declare that zero is indeed a whole number, and that it does satisfy the definition for evenness, and so it is an even whole number. We want the difference of two whole numbers always to be a whole number. That implies that 0 must be a whole number. Take a whole number and double it - the result is an even number. That means zero is an even number. We now have a polished, complete and consistent line of reasoning to show why we think 0 is an even whole number, but this final result is hard-won, and non-obvious when you're at the start with just a vague idea of what might, and might not, prove to be useful. And there are still people who find it disquieting. So now that I've set the scene, I return to the longer discussion that I had on Twitter concerning the definitions of Trapezoid and Trapezium. This is confused by the fact (according to the Wikipedia article) that the meanings of the terms are reversed between British and American English. OK, I will here use the British English versions. Note that I have inverted the terms from the Wikipedian American English into the British English versions. I will be doing this consistently. Wikipedia goes on to note  that there is some disagreement about the definition of Trapezium, with some sources saying that there must be exactly one pair of parallel sides. In short, is a parallelogram also a Trapezium? In this case, Wolfram  doesn't help, and other sites are generally less authoritative. But if saying "exactly one" doesn't allow a parallelogram to be a (special case of the) Trapezium, then one cannot easily state the Trapezium Rule  from calculus. 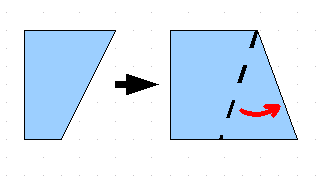 One cannot say that as a shape varies continuously from one Trapezium to another then it's always a Trapezium, because there comes a point somewhere along the way that it's a parallelogram (using the Intermediate Value Theorem). For the mathematician this is largely a non-issue. Definitions are intended to be useful and convenient, and when there is a danger of misunderstanding, they are clarified. Modified definitions are used all the time, with care being exercised on both sides to avoid (or at least reduce) miscommunication. But for teachers this is a nightmare. Most of their students won't become mathematicians and demand rigid, definite and definitive definitions. They won't like the idea that it doesn't really matter, and no doubt the school curriculum will specify that the students must know these things and be able to regurgitate them unthinkingly on demand. For you, sadly, I offer no absolute answers, but I hope I've given an insight into how at least one mathematician thinks about these things.